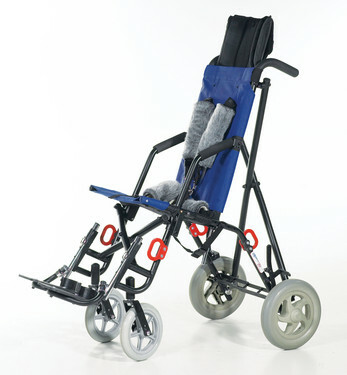 The Kid Kart® Mighty Lite lightweight, travel wheelchair for children offers adjustable positioning and convenient caregiver options. A 16" wide Mighty Lite weighs only 29 lbs, making it more manageable for transport. When your family is on the go, the Mighty Lite folds into a compact package to fit well in small spaces. For a seat position fit to individual needs, the highly adjustable Mighty Lite gives you the option of a 15° or 22° seat angle (tilt) and a 85°, 90°, or 95° back angle. 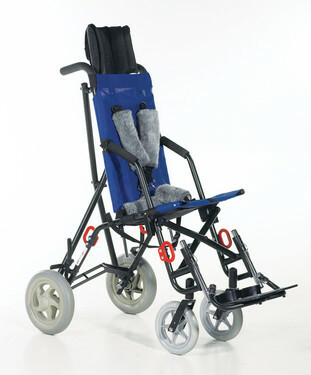 The Mighty Lite is available with multiple pelvic, foot and leg, ankle, thigh, head, upper extremity and trunk support options for versatile and custom positioning of each individual. Chair Weight (Without Footrests if applicable) 29 lbs. Seat Widths 11.75" to 17.5"
Seat Depths 11.5" to 17"
Back Height 22.25" to 23.5"